Knowing your patients’ sleep patterns, eating habits, and medication reactions seems like pertinent information when making accurate healthcare decisions, right? But for many providers that information is either undocumented or unavailable. Enter Project HealthDesign, a program geared to revolutionize the way physicians and patients track and monitor personal health information. Funded by the Robert Wood Johnson Foundation’s Pioneer Portfolio, Project HealthDesign has been created to stimulate innovation in personal HIT. In the current phase, the national program office at the University of Wisconsin-Madison School of Nursing oversees five grantee teams working to demonstrate how to improve the health and well-being of people with chronic disease by helping them capture, understand, interpret, and act on information about the patterns of their everyday lives, or observations of daily living (ODLs). “We hope that this information will enhance personal health records by transforming them into springboards for action and improved health decision making,” says Patricia Flatley Brennan, RN, PhD, FAAN, a professor of nursing and industrial engineering at the University of Wisconsin-Madison and the director of Project HealthDesign. Karen G. Cheng, PhD, an assistant professor in the department of psychiatry and human behavior at Charles Drew University of Medicine and Science in Los Angeles, agrees: “The goal of this round of Project HealthDesign at our facility is to understand whether and how information about patterns from daily life can be collected, interpreted, and acted upon by patients and clinicians.” The team at Charles Drew University and the University of California, Irvine are working to create a mobile device for collecting information from preterm, low-birth-weight infants and their primary caregivers that will allow them to more easily interface with their healthcare providers to improve care and communication. Cheng and her team are working to identify the ODLs that will be most useful to parents and caregivers. Using a participatory design approach, they have been talking with and listening to parents of preterm infants who may be potential users of the mobile device. ”It is important that we listen to parents and healthcare providers so that we can design the mobile device to meet their needs. So far their feedback has been very enthusiastic,” she says. Likewise, a Project HealthDesign team at Carnegie Mellon University in Pittsburgh will be collecting information from sensors embedded in patients’ homes to determine how well they perform everyday activities such as taking medicine. The goal is to present the findings to clinicians, patients, caregivers, and loved ones who will hopefully be able to identify signs of cognitive decline sooner. As with any new technology, certain hurdles must be cleared for it to take hold. From a patient perspective, only technologies that are well designed and fit snugly into lifestyles will be adopted and deemed useful. 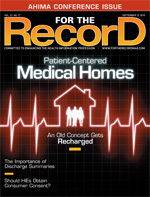 According to Brennan, many patients already unconsciously track their health observations. For example, a woman may know her salt intake for the day is high because her rings feel tight on her fingers. Experts agree that in programs such as Project HealthDesign, deciding how many observations to record and which ones are the most important will be a significant challenge. Many grantee teams are engaging focus groups in the design of their devices and gathering input on what type of mechanisms will motivate them to keep recording their observations. “In our first round, we learned a lot of things,” Brennan says. “Some things that seemed like obvious ‘wins’ for us, like using cell phone cameras to capture and send photos of meals to dietary counselors, were soundly rejected by the participants who tested them.” One team thought a specialized medication management device—a teddy bear with a medication dispensing pouch and a small alarm clock in its belly—would help kids take meds on time. But the University of Wisconsin team learned that no kid over the age of 4 would take the teddy bear out of the house. “On the other hand, elders liked the large-screen display of a tablet computer for medication management, and elders who hated the disembodied voice of the health interviewer were perfectly happy to type answers to questions,” Brennan says. Challenges aside, industry players are excited about the possibilities offered by Project HealthDesign. Dey says prospective users and patients engaged by the Carnegie Mellon team have been intrigued by the idea of using the information garnered from ODLs to spot cognitive decline earlier.